A COLD COMING THEY HAD OF IT. In the Western Church the 6th January celebrates the visit of the magi to the infant Jesus. Their visit has been immortalised by the poet/dramatist T. S. Eliot in his poem, The Journey of the Magi. Its first lines are almost a direct quote from Lancelot Andrewes' sermon for Christmas, 1622 at the Jacobean Court. [I think that Andrewes' theology with the grace of God converted Eliot to the Faith, and for the rest of his life he was a faithful Anglo-Catholic]. to take a journey, and specially a long journey. When they reached Bethlehem the emphasis in Andrewes' sermon is their worship to the Christ-Child, and thus their act is an example to us. "We can worship God but three ways: 1. the soul He hath inspired; 2. the body He hath ordained us; 3. and the worldly goods He hath vouchsafed to bless us withal. We to worship Him with all, seeing there is but one reason for all" (Andrewes, 1622). sermon). The other teaching from the magi's visit is universalism. Their visit should make us aware that Christ can also operate outside of the Church. I know it is a rather contentious issue with some Christians who hold that salvation is limited to those within the established Church, but surely God is greater than any kind of institutionalism, and He did say, "Who is not against Me, is with Me." All expressions of love, goodness and truth flow from Him and when these are manifested in the lives of those outside the Church, who could deny that Christ Himself is not present? Once we start judging, then we are usurping the work of God. Rather our energies should be directed against those obvious workings of the devil in our midst - all types of corruption, deceitfulness and immoralities - those works that destroy our relationship with God and others, and defeat the whole purpose of Christmas. 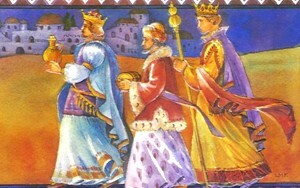 In the Eastern Church, the magi visit is celebrated on the 25th December, alongside the visit of the shepherds and of course the birth of Christ. The 6th January is celebrated as The Holy Theophany of Our Lord and God and Saviour Jesus Christ. Theophany means the manifestation of God in the flesh. The special feature is the Blessings of the Waters as this service commemorates the Baptism of Christ. A large vessel of water is prepared and placed in the church at the end of the Liturgy of St. Basil, celebrated after Vespers on the Eve. There are readings from the Old and New Testaments, including St Mark's account of Jesus' baptism, followed by the chanting of a litany for the sanctification of the water, after which the priest reads a lengthy prayer of blessing. The cross is lowered three times into the water, while the troparion of the feast, 'Your baptism in Jordan, Lord' is sung. River Jordan, prepare thyself; for Christ our God comes to be baptized by John, that by his Godhead he might shatter in thy waters the dragons' unseen heads. Be joyful, Jordan's desert, mountains, leap for joy. For Life eternal has come to summon Adam back. Precursor John, cry out with the voice of him who cries out: Prepare the way of the Lord, and make his paths straight. Let Jordan's desert rejoice and bloom like the lily. For in it has been heard his voice who cries: Prepare the way of the Lord. For the one who weighed the mountains in scales and the valleys in a balance, who fills all things as God, is baptized by a servant. The one who gives rich gifts begins to become poor. The church and congregation are sprinkled, and all drink from the blessed water, and the people even take some of it home with them. There is a second Blessing of the Waters after the Liturgy on the day of the feast itself. Where possible the clergy and people go in procession to a river, or to the sea; where this is not possible, the blessing again takes place in church, with the same order of service. The blessing of water at Theophany renews what happened in the river Jordan. The blessed water is sacramental, and brings forgiveness, healing, and spiritual power and protection to those who are sprinkled with it and drink it. THEY SAW HIS STAR IN THE EAST AND HAVE TO WORSHIP HIM.